For quick and easy hammock hanging – the Nautico Hammock stand, made of powder-coated steel tubes, is the stress-free choice for hanging LA SIESTA Family and King-sized hammocks. With its quick installation this stand is easy to use anywhere - create your own oasis wherever you go. Our powder-coated steel pipes are weather-resistant and therefore ideally suited for the backyard, garden, patio or pool deck. 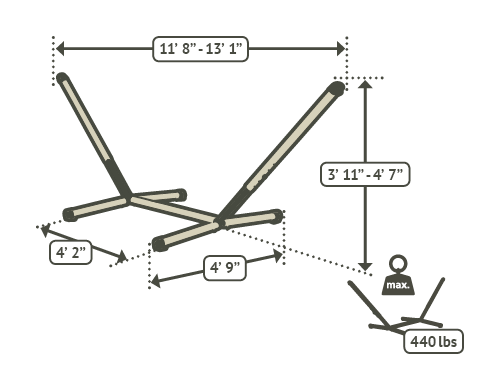 Quickly & easily adjust the frame to find your perfect hammock position. Powder-coated steel: durable and easy to clean. The PlugTube system enables quick assembly of the stand by simply clicking the tubes together.